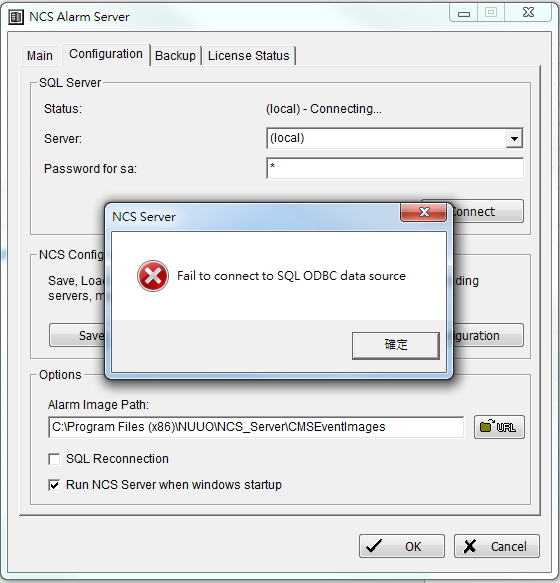 When user tried to connect to SQL server, it pops up the warning message of '' Fail to connect to SQL ODBC data source '' message. 1. Set the wrong password or IP address of SQL server. 2. Setup incorrect configuration in "SQL Server Configuration Manager" after installing SQL server. 1. Please enter correct IP address and password of the SQL server. Please remove below SQL server's components , reinstall SQL server again. It will ask for a new SQL password during installation. (1) Please execute the "install.bat" in path \CMS install pack\Main SW\SQLEXPR_SP2. Otherwise the relevant instance for NCS system will not be built. (2) Un-check the box "Hide advanced configuration options". It will skip the sa password setup step if you check it. (3) Make sure the instance name is "CMAlarmLog", otherwise it cannot connect to NCS server. (4) Select method a or b to connect to SQL server. a. Type "(local)" to connect the SQL server in your local host PC (It is necessary to include symbols for "(" and ")". Otherwise, it wouldn't connect.). b. Drag drop down list and pick up a server name which include "CMALARMLOG" which should be the same as the instance name you setup before. 2. About detail steps of re-installing SQL server, please refer to CMS user’s manual. Note: NUUO CMS (NCS) started to support SQL 2014 since version 2.10. It supports SQL server 2005 on versions below v2.10.